The MAQ Index is a groundbreaking analysis of audio quality on mobile devices. It provides developers with insights about the devices best positioned to run audio apps, and it offers consumers granular information about the audio performance of their devices. The index is based entirely on performance analysis of JUCE-based apps across the iOS and Android platforms. JUCE is ROLI’s C++ framework for high-performance audio. Regularly tested and updated, the Mobile Audio Quality index results are presented in a data table and a Visualizer. Both formats plot performance scores according to the primary criteria of latency and glitchiness. While the MAQ Index shares granular performance scores of over 100 devices, the minute differences between devices with similar ratings usually do not affect the quality of user experience. For this reason the Index categorizes performance according to a three star system that highlights major differences in audio quality. *** A three-star rating indicates that latency and glitchiness are negligible or virtually nonexistent. These devices are suitable for powering professional live music performances. This is the highest rating. ** A two-star rating indicates that the device is reliable for casual live music performances. Some glitches may occur, and latency may be noticeable. * A one-star rating indicates that the device is not optimal for live music performances. Glitchiness and latency may be pronounced. However, these devices can likely be used for recording and other music-making activities that don’t require high-quality audio performance in real time. 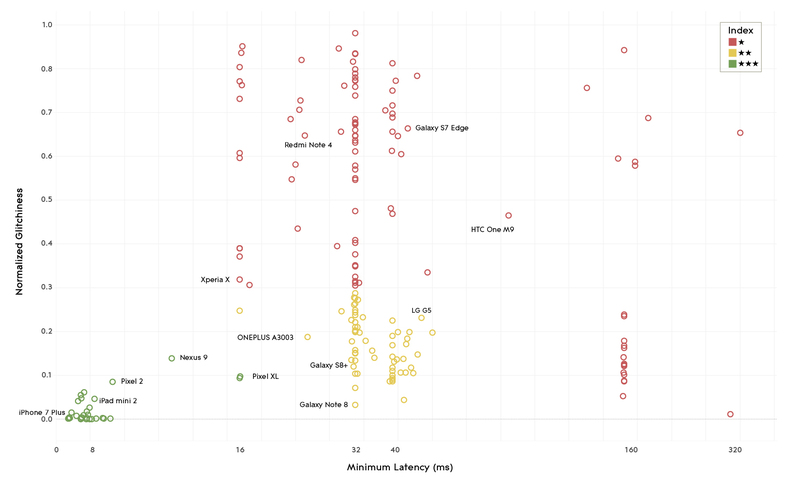 The following Visualizer plots the performance of key mobile devices based on the key criteria of normalized glitchiness and latency. The following tables rank iOS devices and Android devices. Audio latency is calculated as the minimum latency of the audio playback, based on the recommendations of each device manufacturer. It does not consider the hardware latency of the digital analog converter, or of any other software layer of a device that may be adding latency. The latency is calculated from the number of buffers used, the hardware buffer size and the sample rate. The actual device latency will always be higher than the value we calculate as the hardware also has an associated latency, which will vary from device to device. Audio glitchiness, or crackling in the audio output, is a function of the number of underruns that occur in a certain time unit during audio processing. An underrun occurs if the time it takes to process a block of audio is longer than the time it takes for the audio hardware to play back the same block. Mobile devices use techniques such as double, triple or quadruple buffering to avoid a “glitch”. Multiple buffering increases the audio reliability but it also increases latency. If the audio processor never detects an underrun, then the performance score prior to latency calculation will be 100. If the audio processor is constantly underrunning then the performance score is zero. A unique engagement with a JUCE app on Android or iOS. A user rating is a qualitative comment left by users on the Play Store of Apple Store. We use User Ratings to validate the statistical data.